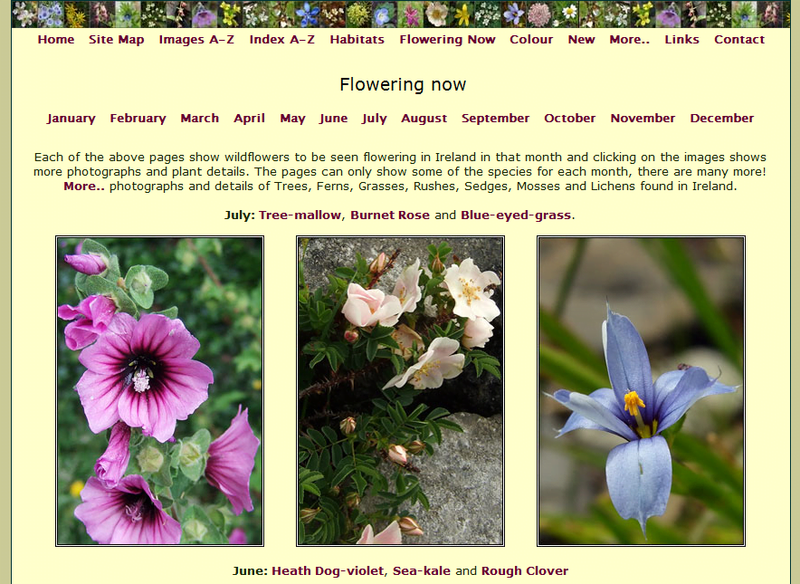 This week’s Site of the Week is Irish Wildlflowers. I don’t know about you, but while I marvel at the beautiful intricacy of our native Irish wildflower species, I often struggle to identify them. There’s no substitute for a really good wildflower field guide, of course, but if you find yourself wondering what on earth that fabulous flower was taking a few photographs on your digital camera, and looking it up online, can be a really useful way of narrowing down your options and getting a positive ID. One of the best online resources for information on native wildflowers in Ireland is the excellent Irish Wildflowers website. It offers an A-Z list of more than 800 Irish wildflowers, covering native and introduced / naturalized species. You can browse an A-Z index of common names, latin names, Irish names and family names, or, if you’re working from visual cues, try working your way through the the A-Z photo index. You can also filter your search by habitat, which can be a real boon when trying to ID flowers from a particular sort of Irish habitat, or by colour. The “Flowering Now” section… which details some of the wildflowers you’re likely to encounter in flower during the current month… is another useful feature (you can also click through to any month of the year to see what’s likely to be flowering when). All in all an excellent site highlighting the remarkable wildflower diversity in Ireland, and a great online resource to help you get to grips with your wildflower ID. Im no expert on wild flowers, but i spend a lot of time in the field birding and always find my self asking the question ” whats that flower?”, now i have a easy to use ID guide..Bookmarked.